The best Philadelphia wedding photographers map out their shots well before they they ever pick up a camera. Especially when it comes to key parts of a Philly wedding, such as the couple’s first dance as newlyweds. When we have taken pictures of that sacred moment, our best images have usually come from one of two approaches. Sometimes, superlative photos of a first dance at a Quaker City wedding are the result of using wider-angle lenses. Those shots capture newly-married brides and grooms on film with all their family, friends and invited guests in the background watching. In other situations, the first dance photos look better when the focus is entirely on the new husbands and wives. Fortunately for their clients in the City of Brotherly Love, a Philadelphia wedding photographer can always get both shots and decide which looks better later! As a husband-and-wife team, we usually photograph weddings together. That means we can take pictures of the same wedding-day moment with different lenses and from different angles. So you are covered no matter what! Including the guests in a first-dance photograph at a Philly wedding can lead to great results. Capturing their reactions of can amplify the power of the picture tremendously. The bride and groom are obviously happy as they enjoy one of their first experiences as a married couple. The onlookers generally share that joy as they watch the proceedings. A wider-angle photograph frequently captures the wedding guests smiling or shedding tears of happiness. This echoes the emotions the couple is experiencing on the dance floor and suffuses the entire image with that feeling. Photos of a first dance in which only the Quaker City newlyweds appear can also be very impactful. But they are visually striking in a very different way. Because the focus is solely on the two people dancing, the photograph highlights other elements of the scene. It is true that most of the important people in their lives are watching as the newlyweds dance. However, many Philadelphia-based brides and grooms are not aware of who else is there at that moment. Many newlyweds are lost in their own world as they share their first dance together. With the memories of exchanging vows still fresh in their minds, they are all that matters to each other. The pictures of them alone on the dance floor tend to emphasize this. They tend to show how the couple feels like they are the only two people in the world at that moment. This photo is an example of how well that second approach can work. We chose to isolate this Philly bride and groom in the frame because they were lost in one another’s arms during the dance. At the moment when they kissed, it did not matter that there were hundreds of guests watching them. There was only her and him, and these Philadelphia wedding photographers wanted the photo to reflect that. We also decided to capture this image in this way because the Philadelphia wedding venue was perfect for it. 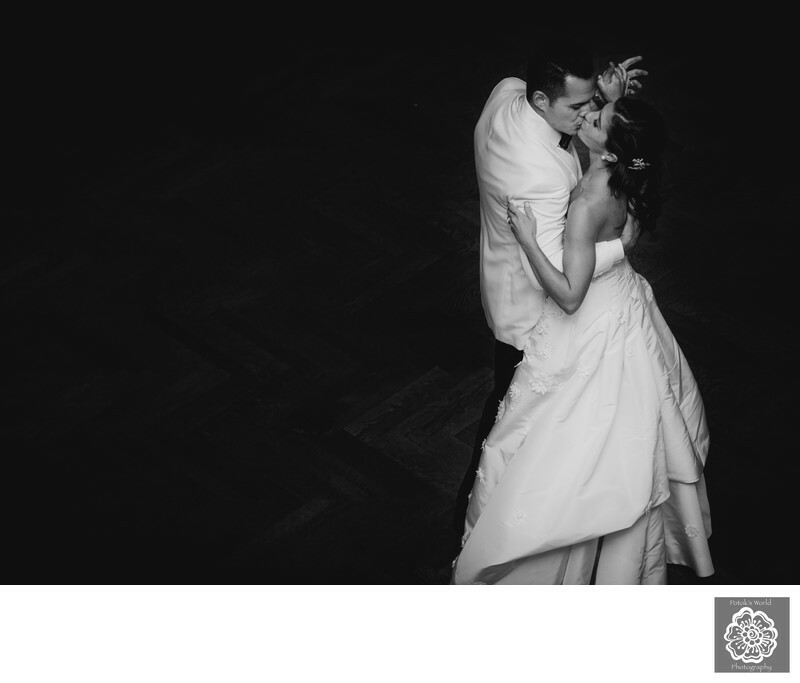 This bride and groom chose the Union League of Philadelphia for their marriage celebrations. It is one of the most luxurious and elegant in the City of Brotherly Love. One of the best parts of the club is Lincoln Hall, a fantastic and opulent ballroom on its top floor. That space has a fascinating history, as it was dedicated in 1913 with President William Howard Taft in attendance. It is a very “Philadelphia” venue for a wedding, because numerous portraits painted by local artists adorn the walls. More importantly for wedding photography, it has beautiful hardwood floors and dazzling chandeliers. Its best feature, though, in our professional opinions, is the balcony that runs near the ceiling across one entire side of the room. This allows a Philadelphia wedding photographer to get up above the scene during a wedding reception. Taking pictures of subjects below the photographer eliminates potential distracting elements in the background. That is how we were able to capture this beautiful image of these Philly newlyweds alone on the dance floor. Location: Union League of Philadelphia, 140 S Broad St, Philadelphia, PA 19102.